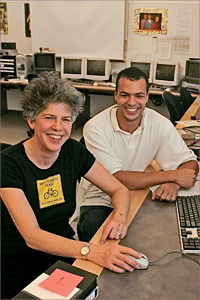 Sophomore Ethan Clarke (right), working with Professor Su Friedrich in the video editing lab at 185 Nassau St., said he particularly values the way Friedrich fosters inventiveness in her students. "She allows you to be as creative as you want to be and can be," he said. Su Friedrich's evocative and experimental films challenge audiences to think in a different way about topics ranging from sexual identity to American health care. Just as she expands the borders of cinema with her films, the Princeton faculty member inspires students to push themselves in new directions with her teaching. "From the first class I took with her, she has constantly challenged me to take my artwork to the highest possible level," said Kelly Sortino, a member of the class of 2003 who is now an admission officer at Princeton. With Friedrich's guidance as her adviser, Sortino completed a thesis that was artistically inventive as well as technically accomplished. Friedrich, a professor of the Council of the Humanities and visual arts, came to Princeton in 1998 and is the first tenured filmmaker on the faculty. She has developed a reputation for getting students to explore ideas in ways they didn't think were possible. "To me it's really rewarding when students respond to provocation and open up their minds," Friedrich said. "In every class there are students who really surprise me -- and surprise themselves -- by making work they never thought of making before."